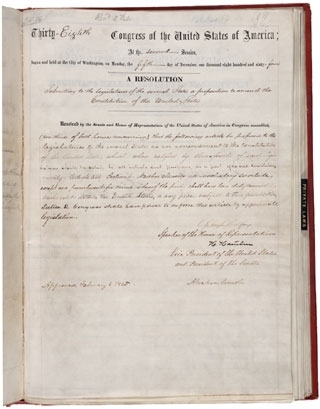 Today U.S. President Abraham Lincoln signs the Thirteenth Amendment, thus sending it to the states for ratification. From that meeting, during which Savannah’s black ministers were represented by Baptist minister Garrison Frazier, arose Sherman’s decision to provide 40 acres of land to each freedmen family, a policy enacted four days later, on January 16. The land reserved for freedmen is along the South Carolina coast, formerly property of large slaveholders. Already, freedmen, many Baptist, are being resettled upon the very plantations where vast numbers of slaves had toiled for generations. Freedom and land are that for which slaves have long hoped. 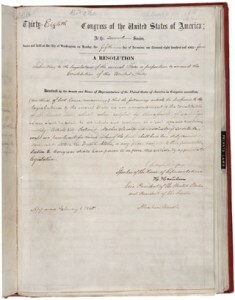 Many freedmen are now experiencing the fulfillment of their dreams. Determined to thwart the hopes of blacks in the South is the Confederate States of America. With the Confederacy barely standing at this point, devoted white Southerners pin their final hopes on Confederate General Robert E. Lee, this week promoted to General-in-Chief of Confederate Armies. Mired in trench warfare at Petersburg and his Army of Northern Virginia hemorrhaging deserters, the renowned general is himself in desperate need of a miracle.